Is CalPERS a Canary in the Coal Mine? CalPERS’s announcement of its intention to exit its $4 billion hedge fund portfolio on 15 September grabbed industry headlines. And rightly so. CalPERS (California Public Employees’ Retirement System) has a long history of thought leadership in its corner of the institutional investing world, and its actions are widely watched by other large pension funds. In fact, almost exactly 15 years ago, CalPERS touched off a firestorm with equal bravado by proclaiming it would invest in hedge funds for the first time. More broadly, the CalPERS news can be applied to a framework that considers the impact of investment leadership and job risk on both an individual decision maker and future industry trends. As depicted in the following chart, a simple 2×2 matrix pits investment decisions on the y-axis against the ex post outcomes of those decisions on the x-axis. We simplify investment decisions as either following the crowd or going against it, and we describe the result as either a winning bet (outperform) or a losing one (underperform). The chart shows what we believe to be the likely assessment by the actors making the investment call. Career risk, according to Jeremy Grantham of GMO, is by far the biggest challenge for professionals. By choosing to invest with the crowd, the outcome in either ex post performance scenario is perfectly acceptable to the decision maker relative to the alternative. If the investment works out, the constituents are usually happy, irrespective of the path taken. If the investment falters, the decision maker can talk about the rational process involved and not get fired for hiring the perceived market leader (IBM in the 1980s, Goldman Sachs in the 1990s, Blackstone in the early 2000s). This matrix reveals the significant challenge faced by a professional investor in sticking his neck out and leading others in a new direction. The question at hand is whether CalPERS’s recent announcement will become a successful example of thought leadership that prompts a wave of outflows from the industry. The world gets far more interesting when someone outspokenly defies the crowd and subsequently earns outsize returns. David Swensen of Yale University came to prominence in part by writing a tome about Yale’s investment process and in part by backing up that differentiated asset allocation with an impressive track record after the book’s publication. CalPERS became a thought leader in the hedge fund space from a combination of its 1999 announcement and the terrific performance by hedge funds amid market turmoil in 2000–2002, as shown below. When a thought leader takes a new stance and succeeds, her peers’ career risk shifts from investing in the new thing to not investing in it. Back in the 1990s, investing in hedge funds was a form of job risk for institutional allocators, whose boards were leery of so-called secretive pools catering to the wealthy. Yet, those taking the unconventional approach back then had a robust opportunity set and were rewarded with uncorrelated, equity-like returns. As that occurred, the conversation at the board level and the commensurate job risk shifted from investing in the new thing to being left out of the game, and hedge fund industry assets soared. 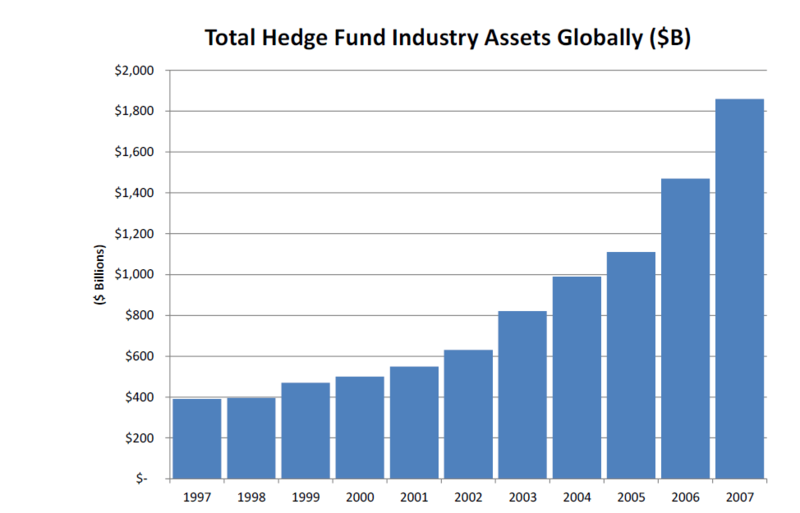 In the five years from 2002 to 2007, following this golden era of hedge fund relative performance, hedge fund industry assets tripled from approximately $626 billion to $1.8 trillion. Alternatively, industry participants tend to ignore leading-edge shifts when thought leaders’ prognostications fail to deliver. Whether calling for market moves (see Meredith Whitney, Elaine Garzarelli, or James Glassman) or a novel asset allocation strategy (George Washington University endowment), leading thinkers without performance follow-through are soon forgotten. For institutions to follow CalPERS’s lead, hedge funds would likely need to experience a prolonged period of pronounced underperformance. A Coal Mine or a Lump of Coal? Through this lens, we can attempt to forecast the industry’s reaction to CalPERS’s announcement by looking both back at its incentive in making the announcement and ahead to whether its divestment from hedge funds will be a winning bet. As a starting point, CalPERS’s decision this time around was not a controversial, leading-edge change. For its own idiosyncratic reasons, CalPERS never made the commitment to hedge funds it originally intended to make 15 years ago. First, at only 1.5% of its assets, hedge funds were insignificant to CalPERS’s overall investment program. In fact, the $4 billion in its portfolio today never came close to achieving the $11.25 billion long-term target it articulated in 1999. Moreover, CalPERS denominated that original goal in 1999 dollars. At today’s purchasing power, the target would equate to between $22 billion and $25 billion of hedge fund investments, or around six times the amount it actually invested. Ramping up to that scale quickly and effectively would be an insurmountable challenge for any allocator — or any hedge fund manager for that matter. Second, we would surmise that this relatively small investment likely led to a significant misallocation of CalPERS’s internal resources. Hedge funds often command more research time than do traditional investments, so the subportfolio may well have taken up far more than 1.5% of the staff’s efforts. Even worse, with public scrutiny at the forefront of the CalPERS debate, the subject of hedge fund fees no doubt took up far more than 1.5% of its board’s discourse. Lastly, following the unfortunate passing of former CIO Joe Dear, the organization’s new CIO has a chance to make his own mark. By headlining the fee savings of divestment, Ted Eliopoulos can earn a quick win with his constituents, an important step in his building long-term confidence as a leader. In summary, regardless of the program’s performance, which appears to have been well below hedge fund industry norms, CalPERS seemed ill suited to making a substantial commitment to hedge funds. Other very large pools with similar constraints that are currently underallocated to hedge funds may find themselves challenged to scale up and may follow CalPERS’s lead. However, we believe that those who currently have a meaningful and well-performing hedge fund program also have stronger hands and a different set of conditions to evaluate. Looking forward, our suspicion is that CalPERS’s recent announcement is like a canary in a coal mine but perhaps not the one the organization intended. Far from signaling the industry’s demise, we think that CalPERS’s announcement means that it has thrown in the towel with respect to its hedge fund program at just the wrong time in the market cycle. We believe that the next five years in the equity and bond markets are highly unlikely to look anything like the stimulus-induced last five. After five years of poor relative performance, hedge funds are overdue for their day in the sun. The core focus of hedge funds — to protect the downside — continues to resonate with investors, who have bolstered allocations even as the industry has underperformed. Without the tailwinds that have allowed passive investing to lead active management in general and hedge funds in particular, allocators must seek other routes to achieve investment goals. Thus far, many institutions have stayed the course in partnerships with the best and brightest investment talent in public markets globally. With great respect for CalPERS’s willingness to take a public stance — and recognizing that career risk may shift for some followers — we continue to believe that hedge funds constitute an important part of a well-diversified investment program, especially if the rosy skies of the last five years give way to darker clouds down the road. Ted, that’s an interesting perspective, thoughtfully presented. As you know, I argued three years ago that hedge funds were collectively managing more money than was consistent with meeting the return expectations of clients. So far as you note, results continue to disappoint. My question to you is, do you think there is a point at which you’d agree there is too much capital invested in hedge funds? If so, how would you know if we were at that point? And lastly, what is it about today’s returns that makes you comfortable that today’s broad AUM levels are capable of earning acceptable returns in the future? Any successful investor needs to be able to change their mind when the facts change, and I hope I’m sensible enough to do so without drawing a line in the sand. Hedge fund assets the last few years are the same or less than they were in ’06-’07, when hedge funds demonstrated significant alpha. As a result, although the number of data points is thin, my sense is it’s too early to tell. What seems a far more likely causation is the headwind created by low interest rates on hedge funds. I imagine if we saw rates up at “normal” levels and hedge funds still performed below expectations, that would be cause to re-evaluate. Until then, any sweeping conclusion can’t be substantiated by facts, especially when many hedge funds have performed quite well in this period. Good summary, Ted, but I think I’m with Simon. The evidence against hedge funds, now and in the future, is much stronger than I think you acknowledge, and I don’t see the industry getting back on track without some pretty radical changes. CEM Benchmarking also estimated that the average pension plan would have done BETTER by REDUCING its allocation to hedge funds: a one-percentage-point reduction in its hedge fund allocation would have improved overall performance by 2.1 basis points per year. Notice that the 14-year historical period included the period of what you call “terrific performance by hedge funds amid market turmoil in 2000–2002” and “this golden era of hedge fund relative performance.” Notice also that it included the liquidity crisis of 2008-2009. If the main selling point of hedge funds is that they provide downside protection during a crisis, then one legitimate conclusion is that institutions just don’t want to be in hedge funds for more than a year or two, because their underperformance during all non-crisis periods completely overwhelms the limited periods of positive contribution. Finally, investment costs of hedge funds were higher than for any other asset class except private equity, averaging 125 basis points per year, compared to just 17 bps/yr for U.S. Broad and U.S. Long Fixed Income. Clearly if you’re willing to give up some return in favor of downside protection, a traditional bond portfolio was a much, much better choice. I’m not sure which DB pension funds actually invested in hedge funds before 2002 (CalPERS themselves didn’t make their first investment until then despite the announcement in ’99). A better data set for the period might come from an E&F universe, who were early institutional adopters. Cambridge Associates might be one such source if you are curious. Before dismissing a broad investment area willy nilly, I’d suggest diving in and getting to know what’s underneath the surface. The conclusion I have come to after doing this work across asset classes for a long time is that the best and brightest spend their time where the compensation is best, and today in the public markets, that’s clearly in the hedge fund universe. Wow. I don’t disagree with your argument that “the best and brightest spend their time where the compensation is best, and today in the public markets, that’s clearly in the hedge fund universe” (except that compensation is pretty darn good in private equity, too) but there’s a pretty basic flaw in applying that to investment management: the compensation that goes to the hedge fund (and private equity) managers does NOT go to investors. If I were among the best and the brightest, I would do the same thing: go to where I could reliably get tremendously high compensation even if I delivered consistently lousy returns. It must be just the stupid people who focus on producing good returns for their investors rather than for themselves. 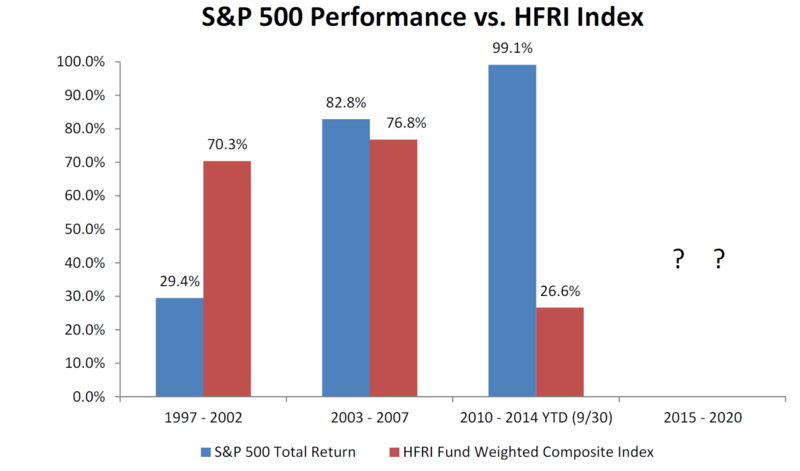 “These findings indicate that hedge fund holdings and trading are not adding value on average. … In terms of stock picking, there is some weak evidence that hedge funds outperform mutual funds on a value-weighted basis, but these superior returns are largely concentrated in the high price-to-sales (technology) sector in 1999 and 2000. … Hedge funds exhibit no ability to rotate capital among different asset styles at opportune times and their average style selection slightly underperforms mutual funds. Survey after survey is showing that in the eyes of people, trust in finance ranks at the bottom. Have you seen for instance the Edelman survey? Where’d be trust in hedge funds within the world of finance? Make a guess, perhaps at the the bottom within finance? What do we know, is it the smartest or the least trusted who spend their time in hedge funds? Let’s try to be less arrogant and more evidence based. I had the same thought, Mabelle. I guess the investment strategy is “put your money where the investment costs are highest, because those must be the smartest people.” So if I waste more of my investors’ money, they’ll flock to me. My apologies – I didn’t mean the comment to be arrogant. That statement is purely my perception from having met hundreds if not thousands of hedge fund and long only managers throughout my career. I am not a hedge fund manager myself, but do believe that the talent of professional investors in marketable securities today has gravitated towards hedge funds and away from long only. One statistically insignificant data point to consider: I can think of less than a handful of successful new long only businesses launched in the last few years (Doubleline and Wintergreen come to mind), but can point to at least a half dozen very successful hedge fund launches every year. If the market is efficient in allocating capital, that might say something about where the new breed of professional investors in the upper echelon (not in aggregate) are residing today. I think you hit the nail on the head: “if the market were efficient in allocating capital,” I don’t think it would be going to hedge funds. One of the key assumptions of Efficient Market Theory is that investors are fully informed. If investors were fully informed (and fully rational, another key assumption), then they would make use of the evidence showing that hedge funds have been poor for a long, long time, and they would get out. The fact that capital is still flowing in to such a poorly performing asset class can be taken as evidence that investors are not fully informed, and therefore that markets are not efficient. More seriously, one of the basic problems with hedge funds (and private equity, including private equity real estate) is that asset values are not properly measured, making them appear to have less volatility than they really do. Again, investors are not fully informed as to the riskiness of their investments in hedge funds (and private equity). Basically, the “best and the brightest” have discovered that they can systematically take advantage of investors’ lack of information to extract extraordinarily high fees for the “service” of making investments appear to be less risky than they really are. Yes, that’s smart–but it’s not good investment management. Mr. Seides is probably one of the most highly regarded managers in the fund of funds space, and, for that reason, it’s truly fascinating to see what a thin argument he musters in defense of hedge funds. Indeed, it actually gets weaker with each further comment, and provides an interesting window into the hedge fund community. Most significantly, note how in every post his comments focus on just how smart, talented, and industrious his peers are; we don’t see citations of studies, any analysis, or actual performance results, much less any refutation of the mountain of evidence compiled by Mr. Lack or other critics. When Mr. Case marshals substantive, detailed arguments to make his case, Mr. Seides, accuses him of not “diving in” to the details, and then fires back with what Seides himself calls “statistically insignificant data.” Does he not see the irony here? It may not be arrogance so much as the insular, self-referential world that many of these managers inhabit — the extreme case being Mr. Paul Singer’s recent comments about home inflation in Aspen and East Hampton proving that we nearing some sort of hyperinflation. As Mr. Lack has pointed out many times, the hedge fund industry has retreated from earlier claims of absolute return, and then retreated from uncorrelated market returns, and finally is clinging to the idea that they won’t lose as much money during a bad downturn as a passive index fund. That last argument is not standing up too well to recent evidence and studies, so the last refuge of the community is the assertion that they are the smartest and best compensated individuals in the public markets. With 98 percent of the profits from its industry retained as fees (as Mr. Lack has pointed out), it’s clear that this last argument is good place to plant your flag, Mr. Seides. Yes, you and your peers are reaping millions. But investors should stay as far away as possible. Thanks for your kind words about me. You are correct that in my attempt to respond to blog posts quickly, I have not supported statements with research and data. Suffice it to say that plenty exists, the best of which comes from the experience of longstanding investors in hedge fund vehicles. As for refutations, I’ll leave that to others with more time. For a critique of Simon Lack’s book, I would suggest you look up the review by Brian Portnoy, a former academic and former allocator who took issue with many of Simon’s methods. I’ll conclude these posts by saying that hedge funds are an investment vehicle constituting a wide array of strategies and asset classes that may be suitable to constitute a place in an investor’s portfolio if implemented effectively. 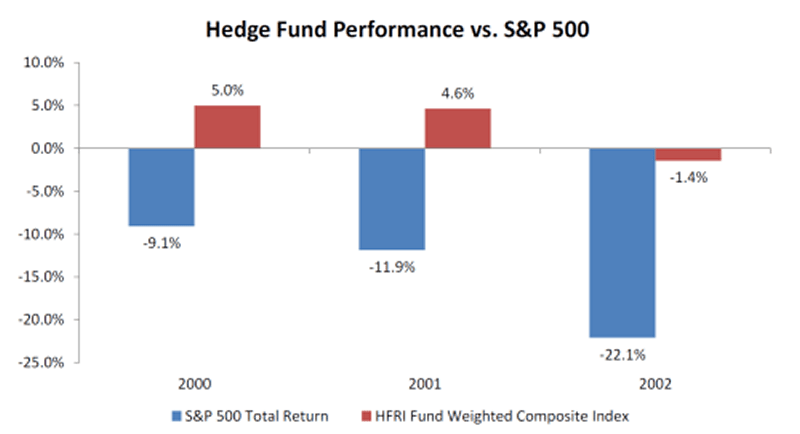 Many others may conclude that hedge funds are too expensive for the returns they deliver. Both are valid arguments, and I find it a bit extreme to blindly support or adamantly ignore all hedge funds because of a broad brush statement about fees or returns in aggregate. I’ve seen this many times, and it’s a very interesting tactic. When hedgies are talking about how wonderful hedge funds are, it’s all about the category as a whole. Notice Ted’s initial post: nothing at all about “a wide array of strategies and asset classes,” only about “the terrific performance of hedge funds” as an entire category. But when others start criticizing hedge fund managers–and especially when they produce data showing that hedge funds haven’t actually performed well in the real world–suddenly the hedge fund world is “a wide array of strategies and asset classes,” meaning it must be somebody else who’s performing poorly. You’re right, Ted, nothing in investing is that black or white. For example, you were crowing about how great hedge funds did in 2000, 2001, and 2002 while the S&P 500 lost ground all three years. Well, no investor needed hedge funds to protect against losses in large-cap stocks in those years, and they certainly didn’t need to pay hedge fund fees. The U.S. bond market outperformed hedge funds in all three years, even before fees and other investment costs: the BC US Agg gained 11.6%, 8.4%, and 10.3% (for a total gain of 33%), while the “terrific performance by hedge funds” amounted to a piddling 5.0%, 4.6%, and -1.4% (for a total gain of 8%) according to your data. The U.S. real estate market did even better: the FTSE NAREIT All REITs gained 25.9%, 15.5%, and 5.2% for a total gain of 53%. So did the global real estate market (+13%). So did non-U.S. bonds (+13%). So did TIPS (+42%). So did commodities (+35%). So did mid-cap value stocks (+10%). So did small-cap value stocks (+24%). There’s nothing wrong with saying that some hedge funds, some of the time, may be suitable for some investors, IF “implemented effectively.” That’s sort of like saying that heroin may be suitable for some patients if implemented effectively. Still, it’s way better to stay away from it. As a fun comparison, let’s take Mr. Seides on his own, redefined terms in his latest post, and narrow our focus to what we know about the performance of his own fund, Protege Partners; specifically, let’s revisit Warren Buffett’s July 2008, 10-year bet that a simple Vanguard S&P 500 index fund would outperform a fund of funds chosen by Protege. Nomura brings us up to date on the long bet, and it has not been going well for Mr. Seides — six years into the bet the Vanguard fund has outperformed Protege by a wide margin. The reasons why are devastating not just for Protege, but the entire class of similar funds: both beta and correlation with standard asset classes are high; alpha is near zero (if not negative), and just to add insult to injury, there are those ridiculous costs and fees hedge funds charge compared to the de minimis Vanguard fees. The panoply of numbers and charts are there for all to review, and it’s not pretty for Mr. Seides’ case. As the late, great Pat Moynihan once said, everyone is entitled to his own opinion but not his own facts. I wasn’t going to return to this discussion, but, “breaking news” does justify one last comment. It so nicely brings us up to date (h/t Mr. Simon Lack) the hedge fund mirage. “Through the seven years, Vanguard’s 500 index fund, as represented by its Admiral shares, is up 63.5%. That’s the portfolio carrying Buffett’s colors. Protégé’s five hedge funds of funds are, on the average—the marker the bet uses—up an estimated 19.6%. (The “estimated” takes into account that not all of the five funds have final figures for 2014),” writes Loomis. One can only wonder how you justify charging Protege’s clients enormous fees over the past seven years to earn a mere fraction of a Vanguard fund at a de minimis fee. That’s an investment letter and argument that only the best and brightest could draft, I’m sure. Robert, check out Ted’s excellent empirical analysis in his new article, “Betting with Buffett: Seven Lean Years Later” (http://blogs.cfainstitute.org/investor/2015/02/12/betting-with-buffett-seven-lean-years-later/).